Hinata may not have been allowed to participate in the Miyagi Prefecture Rookie Camp, but he’s determined to learn something from watching on the sidelines as a ball boy! Meanwhile, thanks to the other players at the All-Japan Youth Camp, Kageyama starts to worry about how he interacts with his teammates. Then, with the Spring Tournament looming ever closer, Date Tech arrives at Karasuno for a practice game! Haruichi Furudate began his manga career when he was 25 years old with the one-shot Ousama Kid (King Kid), which won an honorable mention for the 14th Jump Treasure Newcomer Manga Prize. His first series, Kiben Gakuha, Yotsuya Sensei no Kaidan (Philosophy School, Yotsuya Sensei’s Ghost Stories), was serialized in Weekly Shonen Jump in 2010. 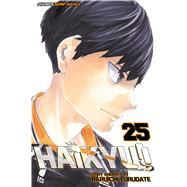 In 2012, he began serializing Haikyu!! in Weekly Shonen Jump, where it became his most popular work to date.